At the numbers below. Tell us who you are and about your store. And we’ll lead you to our offline wholesale site. See our prices, terms, order forms, etc. We ship on every business day and will do whatever it takes to make sure you receive your order when you need it. We make it easy to include Wine Teasers in your product lineup! A case of games includes 10 boxes. We take wholesale orders for quantities that range from a single case of 10 games to hundreds of cases or more. It's easy. Just let us know what you need and when you need it! Wine Teasers is a product of Fine Wine Games, Inc.
Wine Teasers is a friendly wine trivia game in which small groups of players answer trivia questions in hopes of winning virtual bottles of wines for their team's wine cellar. 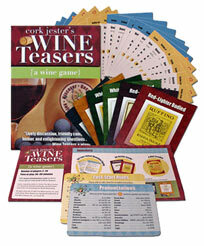 Although the game uses wine trivia questions, each question has a big hint, allowing even beginners to compete. We like to call it "friendly trivia" because of the non-competitive nature of the game.